Saplings barely have a chance to sprout before the deer eat them. Deer are eating Wisconsin forests and changing them at an unexpectedly fast rate, according to a study published in the September issue of Forest Ecology and Management. The University of Wisconsin’s Donald Waller, professor of botany and environmental studies, and Lauren Bradshaw, a graduate student, looked at 30 years of U.S. Forest Service data for the study. “The article was inspired by the need to do a better job monitoring deer impacts in the Midwest,” Waller said. Wisconsin and Michigan monitor deer by counting, which is expensive, time-consuming and not the most accurate way to estimate deer populations. Bradshaw had the idea to use existing data on the regeneration of trees from the U.S. Forest Service and Forest Inventory and Analysis as a shortcut. This project was her master’s thesis. “Measuring deer impacts can be easy but it depends on the scale you’re interested in,” said Sarah Johnson, a professor with the biology and natural resources departments at Northland College in Wisconsin. Bradshaw and Waller’s study was a large scale one, covering the northern Wisconsin woods region. Their project was ambitious, but the idea paid off. “I don’t think we were expecting there to be such a stark contrast between the highly preferred (trees) versus those which aren’t,” Bradshaw said. The stark contrast is the difference in data they got for eight out of the 10 tree species they pinpointed. Deer were eating the saplings of those eight species at unexpectedly fast rates, even though they had middling interest in most of those species. The only species with no deer impact were the two that deer found unpalatable. 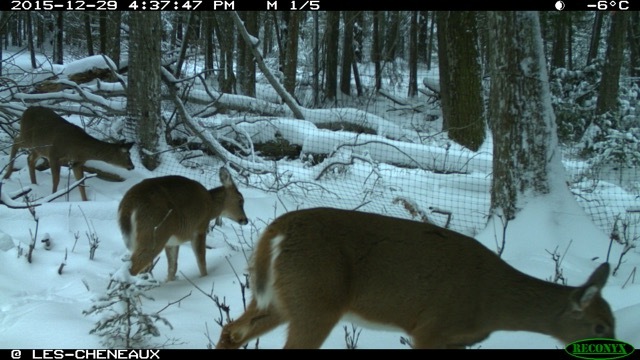 White-tailed deer are eating saplings in northern Wisconsin forests. 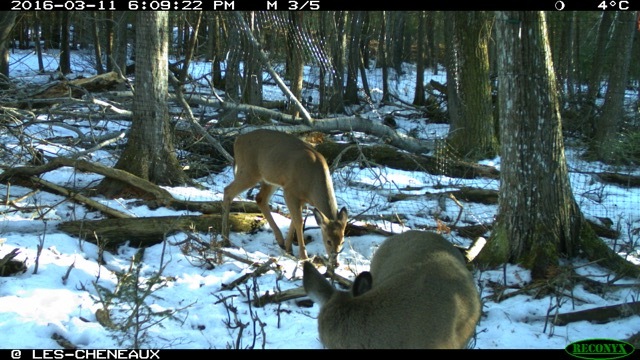 For the tree species that deer love to eat most, Bradshaw and Waller could not calculate the exact rate of relation between the decreasing seedlings and the density of the deer population. “The saplings are now so scarce on the entire landscape that we’re getting zero regeneration, not a single one inch tree, coming up in most of these surveys,” said Waller. Thirteen thousand different plots across northern Wisconsin were surveyed. And with 30 years of data, Waller and Bradshaw are certain their results are not a fluke. Other studies have been done on deer impacts in forests. But by approaching the topic the way they did, the researchers are providing larger scale support for smaller scale studies that have already been done, Johnson said. The study lists the reasons why that is bad. Without those trees, deer will lose their food source, as well as key habitats for them to wait out the winter. Other wildlife species dependent on these trees will also be negatively affected, and tree diversity will decline. Such severe impacts on the forests will linger for 20-70 years, according to the study. Waller said he hopes that the research triggers a shift toward carefully limiting deer so trees can regenerate. What are the 8 trees, read it twice and they aren’t even listed. You only named northern red cedar, Eastern hemlock and northern red oak in this article. And the answer ( actually the cause) is the lack of wolves. I argue daily with individuals that were incorrectly taught by their elders. Nature has a way of regulating itself, however man always has a better way or more important agenda. Wolves have never been the problem with deer populations; men and their belief that wolves are the problem is the problem. They will not kill unhealthy animals – coyotes on the other hand as well as big cats often have eyes bigger than their stomachs.